This is a Freakonomics Radio extra: our full, lightly edited interviews with four members of the San Francisco 49ers offense: quarterback Jimmy Garoppolo, offensive linemen Joe Staley and Mike McGlinchey, and fullback Kyle Juszczyk. We interviewed them for episode No. 350, “How to Stop Being a Loser,” which tells the story of how the 49ers are trying to reverse their fortunes after a few dreadful years. It’s part of our special series called “The Hidden Side of Sports.” This is one of many interviews we did with 49ers executives, players, and other football personnel and you can hear all of them by subscribing to Stitcher Premium. Just go to StitcherPremium.com/freakonomics and use promo code FREAKONOMICS for one month free. This interview, like the others, took place in May, during the team’s first couple days of pre-season practice, or what are called O.T.A.’s, organized team activities. 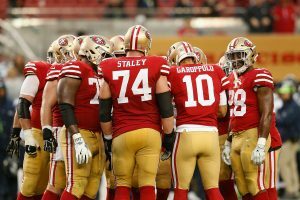 We’ll start with Jimmy Garoppolo, the quarterback who joined the team mid-season last year, as they were on their way to losing their first nine games — and who took over and helped the Niners win their last five games. And was duly rewarded with a five-year, $137.5 million contract. Hope you enjoy. GAROPPOLO: Nice to meet you. DUBNER: Hey, Stephen Dubner, nice to meet you. GAROPPOLO: Nice to meet you guys. DUBNER: Yeah, congrats on everything. GAROPPOLO: Oh, thank you very much. DUBNER: You’re welcome. It’s exciting. GAROPPOLO: How’s your day going? DUBNER: Our day’s going great. Really fun. How’s yours? GAROPPOLO: Busy. But, it’s good. First practice. DUBNER: Was first O.T.A. significantly different from everything else you’ve been doing here? GAROPPOLO: It was just exciting to get back out there really. GAROPPOLO: Being a quarterback, you know, running and lifting is important. But the practice is awesome. Getting out there with the guys and everything. DUBNER: I bet. What do you spend your offseason doing mostly? Conditioning, etc.? GAROPPOLO: Yeah. Just your normal working out. GAROPPOLO: I was here initially, went to Chicago for a little bit. GAROPPOLO: Yeah, had to see the family and everything. And then we got the deal figured out, got out to L.A., and that’s kind of where I do most my training at. DUBNER: Gotcha, gotcha. All right, so you have about 15 minutes here. Is that right? DUBNER: Or more? Three hours? We’ll take it, whatever we’ve got. No, whatever you’ve got, we’ll take it. If we’ll begin, just say I’m Jimmy Garoppolo and you’re listening to Freakonomics Radio. GAROPPOLO: What’s up guys, I’m Jimmy Garoppolo and you’re listening to Freakonomics Radio. DUBNER: Last year was a wildly unpredictable and dramatic and successful year for you. Can you just walk us through it quickly from your perspective? Starting in New England, coming here midseason, and how it ended? DUBNER: That’s really the way it works? GAROPPOLO: Yeah, and it was three days, four days before my birthday, and there was a whole bunch of stuff going on. But you go through so many emotions initially, because you don’t know what’s going on. I’ve never been in this situation before. Your emotions are going wild. And then, you get here and now you’re learning a whole new playbook. It’s like learning a new language. You’re meeting new people, you don’t know anyone’s name. So there a bunch of stuff going on, but, you know, things really worked out well. After a week or two things start to slow down, and you get kind of a routine, and, you know, it worked out well. PRODUCER: The first call wasn’t from your agent, it was like, it was in the press before you actually knew that the team —? GAROPPOLO: No. Fifty of those calls were from my agent. GAROPPOLO: It wasn’t that long, I swear. But next thing I knew, I was a 49er, and, you know, the rest is history. DUBNER: Do you nap every day? GAROPPOLO: No, there’s rarely nap. DUBNER: That was rare. You’ll never do that again. GAROPPOLO: Definitely not during the season. DUBNER: All right, so just talk about, did you have any inkling that you might be traded? First of all, I know teams have been talking about you right? GAROPPOLO: There were rumors and everything, but during the season, especially as a quarterback you’re so locked in, there’s so many things that you have to worry about for the next Sunday that I really don’t have time to really think about that, my agents would keep me notified, but they know for the most part I’m all football during the season. So there were rumors and everything. I didn’t really know whether to believe it, because some of the stuff is hearsay and it turned out to be true. DUBNER: What’d you think and know about San Francisco, the organization, the history coming in? GAROPPOLO: Very rich history. You know, Joe Montana, Steve Young, those guys just paving the way and they went through a little bit of a downstream there for a couple of years, but just, the fans around here are pretty unique. I didn’t know that. Never been out here before getting traded, so when I first got out here the fans, the faithful, I mean they really are faithful through the thick and thin. It’s impressive. DUBNER: Yeah, I mean I don’t know you can tell me as much as you want to, and I only know what I’ve read which is probably true, but I don’t know what your relationship was like with Brady. I’m happy to hear you say anything you want to say, if you want to take a pass on it take a pass. But let’s start with that. GAROPPOLO: Yeah. You know nothing, but the media made it out to seem — We always had a good relationship. You know, initially when I was younger kind of like an older brother type of relationship, but as I got older and matured through the N.F.L., we became closer and we became good friends. You know, we still text here and there. Jacoby was a good friend of mine too. So, the three of us always were texting each other, and it was, you know, everyone said it was a terrible decision to have the same agent, but I think it worked out very well. GAROPPOLO: They, our agents, look out for both of us, both of our best interest. But at the end of the day it’s the N.F.L. So, it’s a business. DUBNER: Yeah. We also read that Kraft made it happen or wanted it to happen, and that Belichick was against it. Tell me what you can about that? DUBNER: Did you hear from Bill Belichick after? GAROPPOLO: Yeah, he was the one who actually told me that, I mean my agent told me initially, but then coach Belichick right behind them told me, and we always had a good relationship. Both of us are very straightforward people, really no B.S. or anything. So, I always appreciated that from coach, he kept it real with everybody whoever you were. Practice squad or the starting quarterback, you know, and you gotta respect him for that. DUBNER: So, everything I’ve read and heard about you coming in, you know, we know the kind of details, we know that Kyle Shanahan originally said let’s give him time to get up to speed, you may not even see him play this year. Then of course you do come in relatively soon and then, as far as I can tell, you’ve never actually lost an N.F.L. game that you’ve started right? GAROPPOLO: I’ve done pretty good. DUBNER: You won two with the Pats, right? DUBNER: But from everything that we’ve heard, from everyone on the exact side and on the players side, you’re some combination of like Y.A. Tittle and Superman and Jesus Christ, like people just gather around you and love you. DUBNER: It’s a pretty good combo. So, tell us, I’m sure you can’t be that good. What are some things that you work hard on, that you struggle with, that you’re trying to get better at? DUBNER: Football and also being part of, I mean, it’s a huge thing you came in, you won five games in a row that you started, and then you’re given what was at the time the biggest contract ever in football, got surpassed, but it’s still pretty big. So, it’s natural for both the team and the fans and maybe even the league to look at you as a kind of savior. That’s a lot. I’m just curious how you process that or if you mostly ignore it. GAROPPOLO: You know, for the most part I just go out and do my thing. You know, everyone sets high expectations and tries to predict things, but at the end of the day, no one really knows anything or what’s going to happen. And I set a higher standard for myself than anyone ever will, so I kind of worry about that more than anything. You know, all the outside noise, it’s just noise. So, you really got to stay focused on, you know, your craft and all the things that we have going on this building, it’s, you know, if you get caught up in all that stuff, you’re gonna have a tough time. The N.F.L.’s hard enough as it is. DUBNER: Yeah. Kyle Shanahan knew you pretty well, he’d worked you out when he was with the, with Cleveland right? For the draft? So, just tell me about that relationship going back and what it’s like now. GAROPPOLO: You know we had a good relationship I met with Cleveland a bunch. They were looking for a quarterback that year. And they ended up taking Johnny Manziel. DUBNER: Trading up to take him, right? DUBNER: Well, that’s what I read, but then I thought when did Cleveland ever have to trade up to get the 22nd pick? DUBNER: No, seriously. Well I am a Steeler’s fan, but still. PRODUCER: Maybe their fourth first-round draft pick. GAROPPOLO: You guys are ruthless. DUBNER: Sorry, no, we’ll move on from that. But anyway, so he’d worked you out a couple times. Yeah? GAROPPOLO: We had a good relationship from really from the start. I mean, he worked me out at Northwestern and I remember. And, you know, he was a young, energetic coach. GAROPPOLO: And we were very similar personalities and I remember going home and telling my parents that. And, you know, I didn’t know where I was going to go or who was going to draft me, but just you meet coaches throughout the process that you get along with better than others and me in college a good connection, right off the bat. DUBNER: So, again if you don’t know football and you read about the kind of offensive mind he has, and that he just tortures defenses by being dynamic and creative, et cetera, et cetera. Can you just talk for a minute about what that means for you as a quarterback and how that fits for you? DUBNER: So give me a call, a play for us here, for instance, and tell me what each term means. GAROPPOLO: Each term? Oh jeez, we’ll be here for a while. GAROPPOLO: That’s a shorter one. GAROPPOLO: So, it tells everyone what to do. But at the same time, you could get into different packages, where it’s one word tells all 11 guys what to do, and it’s just, that’s the complexity of the offense. And now, you’ve got motion, moving around the defenses looking at a hundred different things. You snap it, all of a sudden, and they’re messed up, and it makes my job that much easier, just by, you know, a simple little thing that we did before the ball was even snapped. And that goes back to the film study — the coach’s film study — and all that. And it gives me a lot of confidence in the whole offense as a whole, just you go into that game and you know the coaches have done their studying and done their homework. And it’s nice having a game plan like that. DUBNER: Yeah. Let’s assume you turn out to have a really long and great Hall of Fame career. And if you were to look back this time now, your beginning with your starting career. What would you attribute it to? Because there are a lot of guys who, physically I’m sure, are like you, are close to you, and so on. So, what do you think actually makes you successful at this level? GAROPPOLO: I’ve always really relied on the extra work. The day ends at 2 o’clock say, you try to be here until 8 o’clock. DUBNER: Doing what? Physical, film? GAROPPOLO: Yeah. I mean one day it could be more physical than mental. GAROPPOLO: Everyone has their own routine. And being in the N.F.L. for four years now, going on five, I have a pretty good routine that I’ve gotten used to and during the season, it’s a long tough season. You have to have a good routine that keeps your body healthy and keeps your mind sharp for all 16 weeks. DUBNER: A regular person, not a studly athlete. GAROPPOLO: Well, I do things for quarterbacking. GAROPPOLO: It’s different than your average athlete. You know, I have to stay loose and be able to throw 100, 200 balls a day, every day, and if you lift a ton of weights and get real big it’s tough to do all that. So, it’s a little different than the normal stuff. DUBNER: What’s your diet like? DUBNER: Yeah. Do you cook for yourself or no? GAROPPOLO: Nah, they make phenomenal food here. Why would I cook? DUBNER: Is that why you’re here like 18 hours a day? GAROPPOLO: It doesn’t hurt man, it doesn’t hurt for sure. DUBNER: What’d your folks do for a living? GAROPPOLO: My dad was an electrician. He just retired three, four months ago, something like that. And my mom was kind of a cook, chef I guess you could say, and she’s looking to retire pretty soon too. DUBNER: Are they going to move out here, now that you’re here? GAROPPOLO: I don’t think so. DUBNER: You have other siblings? GAROPPOLO: I have three brothers, yeah. Two of which are moving out here. GAROPPOLO: And the third is an architect in Chicago. So, he’s killing it right now. It’s awesome, but my parents, you know, they — I don’t know, we’re a very tight knit family and they’re locked in back in Chicago. So, it’ll be tough to get them out of there. GAROPPOLO: They’ll be out here every week, though. You can count on that. DUBNER: Is that right? Yeah. Tell me, you may not think about it yet, since you’re young, but a lot of guys come into the league with all kinds of promise and even success. And then afterwards, it can be a really hard adjustment, because you’ve been doing this one thing since you were six, eight, ten years old, and kind of had people taking care of things. Can you just talk about what you think about the afterlife of an athlete, again I realize it’s not the right phase in your life to ask you this question, but I’m just curious your thoughts? People you’ve seen do it really well and not well maybe? GAROPPOLO: It seems like — You know, I have no idea for myself, that’s hopefully a long ways away. But it seems like coaching is a way that a lot of guys go. I have a bunch of guys that went to school with at Eastern that got into coaching, because they miss that atmosphere, that family feeling. And so every one of them that I’ve talked to is — they love it. And they say you get just as much joy out of that as you do playing. So I don’t know, hopefully that. I got a long, long time until I even have to start thinking about that. DUBNER: Do you have a prediction for this season either in terms of number of wins or how deep into the playoffs? Do you have any idea in your mind whether you want to tell me you’re not like what would constitute a successful season for you? Or how would you describe it? GAROPPOLO: I mean there’s a million things that go into that. DUBNER: Like what would, at the end of the season, if they’re, like name three or four things that would need to happen for you to consider this a successful season? GAROPPOLO: I think we have to have a good O.T.A.s first. GAROPPOLO: Yeah, I mean you’re talking about a successful season. We’ve had one practice so, we’ve got a long way to go. Then we’ll get into training camp, and that’s really where your team starts to come together, and you start to see the mold of the team and we’re just try to create a good team right now, good standard that we set for each other, and I think we’re moving in the right direction on that. DUBNER: Everything I’ve read from every player says that you’re the natural leader, that people gravitate toward you in the locker room and on the field. Is that something you learned to do? Is that your natural way of being? I’m curious about. GAROPPOLO: Yeah, I think I’ve never really tried to fake it or be, I don’t know, someone that I’m not, because everyone says this guy’s a great leader and you should be like him. But I think if you start going out of your comfort zone and doing things you’re not used to. Guys, I mean especially in a N.F.L. locker room, they see right through that. They’re not they’re not dumb. So, you just have to be yourself. I don’t know. I’ve always thought myself as one of the guys and I think that plays a big part in it. PRODUCER: Where are you in the four brothers, like age-wise? GAROPPOLO: No, I’m the little brother. I got two older brothers. GAROPPOLO: They’ll never let you forget it. That’s just, and I’d be upset if they did. It’s just how we were raised. I’m sure it’s made me a better person having them around and keeping me humble and everything. DUBNER: Well, thank you. Good luck. DUBNER: Hope you win a bunch of games, win a Super Bowl. DUBNER: So you can get one or two, but we have to keep. So, if we can toggle between the Niners and Steelers, that’s fine. GAROPPOLO: We’ve gotta see how many Big Ben’s got left in him. DUBNER: There you go. Yeah, I don’t know. Okay. Good luck to you. Thank you very much. GAROPPOLO: Nice to meet you guys. No problem. Next up, our interview with one of the larger and more colorful members of the San Francisco 49ers. STALEY: My name is Joe Staley. I’m a left tackle for the San Francisco 49ers. I’ve been on the team for — this will be my twelfth season coming up, only played here in San Francisco. DUBNER: —by a long shot. STALEY: And the best looking. STALEY: It leads to the right. STALEY: Yeah. Had been broken a couple of times. PRODUCER: You can do that with the facemask on? STALEY: Yeah. So, this is a funny story, we were in Green Bay and I had this old school helmet from like, you know, 1984. STALEY: So that was broken then, and I got broken — We did a one-on-one pass rush back in college with no helmets, for some reason, and I caught a spin move heavy elbow to the nose. Nose, it was completely like on the side of my face. Trainer came over and was like, oh you’re good. I was like, all right, seems pretty official. DUBNER: It looks good now, though. DUBNER: You’ve grown into it. STALEY: Grown into it, I’ve got a big head. DUBNER: So how big are you now? STALEY: Six foot six. I’m about 295, 300 pounds. DUBNER: 295. So, when you started, you thought you needed to be heavier then? Yeah? STALEY: Yeah, I came in the N.F.L., I was pretty light out of college. DUBNER: Did someone advise you to get heavier or you just thought that was the way to go? STALEY: When I came out, I came out in 2007, it was kind of going through a transition between like offensive linemen, being big-bruising-like-type players, and I was very much on the light spectrum of that scale of what guys are supposed to weigh when they came to the N.F.L. So, I just continued to gain weight like I was in college and kind of stopped on about 235 or 335 pounds at one point. 330 pounds and was way too big. STALEY: Yeah, it felt miserable, couldn’t move. Basically, was losing everything that put me into the N.F.L. STALEY: It was my like athleticism and my foot speed. So, one off season just was like, screw this I’m going to try to try it the other way. PRODUCER: What did you have to do to put on that much weight? DUBNER: You’d never played lineman before that though? STALEY: Nope. I got taught the position my sophomore year. DUBNER: And how did you like it when you started? Seem a little boring? STALEY: Hated it at first. No, it was just different. You know, and I wasn’t really a blocking tight end either. I was brought there to catch passes. I was fast for my size, so it was a transition for me. I didn’t really know anything. So, they kind of had a clean slate to work with, I didn’t have any bad habits as far as blocking and took coaching pretty well. DUBNER: I mean your career has obviously turned out great. Do you sometimes think, “I wish I could have stayed a tight end,” though? STALEY: No, I wasn’t fast enough for a tight end, you know. I was fast for a lineman, wasn’t fast enough for a tight end. STALEY: And then had that explosion, the guys here. DUBNER: Yeah. So, for people who don’t know football at all, left tackle — Just describe kind of your primary missions, especially relating to protecting the quarterback, and also what you actually do with your body. STALEY: Yeah, so I play left tackle which is considered the blind side of the quarterback, made famous by that movie. DUBNER: Hey, a book before a movie, c’mon now. STALEY: Yeah, a book, the book. Michael Lewis, right? STALEY: I protect the quarterback’s blind side, so basically when he’s dropped back in a protection, he’s right handed quarterback, he can’t see, obviously, behind him, so that’s why they called it the blind side. And yeah, I mean my primary job in the run game is to move the guy that’s in front of me from point A to point B, wherever the scheme is, whatever the play calls for. We have a plethora of different blocks that we have to do. And then different combinations single blocks, double blocks, you know, whatever they are. And then, in the pass game, basically keep the defender from rushing the passer and getting the sack on the quarterback. DUBNER: I remember we used to hear that, on average, offensive linemen were the smartest players on the team. Some people would say Q.B., some would say O.L. You know anything about it? I mean, do you feel like, is your group particularly, because the playbook, you need to not make mistakes obviously. STALEY: Yeah, it’s a different thing. I think quarterback obviously probably has to know the most. You know, I think in just straight intelligence, you know, offensive linemen tend to be smarter. I don’t know if it’s just because of everything, the way we have to break down a playbook. I have to understand, not what I’m just doing as a left tackle, but I have to understand what the left guard, center, right guard, and right tackle are doing, and sometimes also the tight ends. Then also the formations and I have to know where the receivers are, and all that stuff. So, you have to have a heavy grasp of everything and that kind of ties together as, you know, especially up front like all five guys playing together and I have to know the adjustments that we make. Say a defense comes down and they bring in a safety down that kind of changes are blocking scheme for a particular play. And that all happens within two seconds, so I have to be able to process all that information, know exactly what the adjustments are, what I’m supposed to say, how that affects me, and then also the guy next to me, what my call is to my tight end if I have one next to me. And that’s just on one particular play. DUBNER: Do you make mistakes? STALEY: Yeah, all the time. STALEY: So we have like mental, you can call them M.A.s or, I don’t even know what that stands for mental assignment error or something like that. STALEY: Missed assignment error. There it is. Missed assignments like a mental error. DUBNER: And you’re graded on those after every —? DUBNER: So you’ve had something like six or seven head coaches in your career? STALEY: This is my sixth. DUBNER: Your sixth. So, we can talk a little bit about the stormy years, and then last year, the very bad start and the great turnaround. But before we do that, when Kyle Shanahan came in for a guy like you, offensive lineman, how much new was there to learn? And I guess for every head coach, how much new is there to learn? STALEY: Yeah, every head coach kind of brings something new, because they all have a different scheme that they run offensively and a way of looking at the game of football. I’ve been fortunate and unfortunate to play with so many different head coaches and also, this is not only six head coaches, but eight offensive coordinators. I’ve been eight different offensive systems. I’ve kind of seen everything. When Kyle came in, I knew he was — Basically, his staple was zone, outside zone, inside zone, play action. So, I was pretty well versed in how to attack a defense with that. But what I kind of wasn’t ready for was just how detail oriented his specific scheme is. And how everything is pieced together in the way that he kind of sees Xs and Os and the way he sees a football field is pretty different than typical offensive coordinators. So, I was really excited just because of his reputation that he’s had in the N.F.L., but I got a first-hand experience of that pretty quick. DUBNER: I can’t remember, was it last year, the beginning of last year, when you were hurt and thinking about retiring, and basically everything was kind of garbage? Was that last year during the losing streak? DUBNER: Can you just walk us through last season from your perspective? It was an amazing turnaround, obviously, but also you being hurt — I’m just curious to hear. STALEY: I just had a hip impingement basically something, nothing that was injured, just something that I was kind of dealing with that was causing my right knee to feel like crap, basically. There was not really an injury. There was nothing torn structurally, it was really, really good, but it’s just one of those deals that every time I would load that leg up, which I do every single play, it felt like just basically bone-on-bone rubbing. And it just got to be really, really painful, and something that I was kind of just dealing with through the season and getting a ton of treatment, I mean doing everything I can to make sure I felt as good as I possibly could on game day. STALEY: No, I didn’t miss any games. STALEY: Yeah it was the first time that I was just like this might be my last year. I don’t know if I can just continue to do this if my body is starting to fail me like this and I feel like I’m doing everything I can. It’s just not responding like it used to. DUBNER: If you’d been winning it would have felt different I assume? STALEY: You know, winning kind of heals everything, but also it wasn’t really that, it was just — It was more just the way my body was feeling. DUBNER: Yeah, and then how did it get better or did it not? DUBNER: Herbal tea or something? DUBNER: Did you tell your trainer what you’d done? STALEY: Oh, I told everybody and pumped up about it. DUBNER: Do you think the trainer is going to recommend that for future athletes who have a hip impingement? STALEY: I don’t know. They probably just think that I’m making up stuff. Yeah, just move your body in a weird ways, contort yourself. DUBNER: When you were at your bottom and hurting and thinking about quitting and so on. I know your wife is a former athlete as well who, high-level soccer player, who never made the women’s national team, because of injury herself right? Is that right? So, I’m curious what those conversations were like. Obviously, you’d had a long career, but I’m curious what those conversations were like. STALEY: We didn’t really talk seriously about it, but I had seen her kind of go through this when she was done with playing soccer, the league folded that she was playing in. And just, something that she was playing consistently and at a high-level since she was like six, seven years old, then all of a sudden to be gone just kind of seeing that transition. So, you know, when that day does come for me, it was the first time I’ve actually brought up possibly not playing football anymore and probably got a little bit scared of even talking about that. DUBNER: Do you have thoughts about what you’ll do afterwards? STALEY: No idea. No idea. STALEY: I don’t know. I don’t want to. DUBNER: I mean, I don’t want to jinx it if you’re not, if you don’t want to go in that direction. STALEY: I’m more of a radio guy. Maybe? STALEY: No, I don’t know. I have no idea. DUBNER: You’ve got the nose for radio. STALEY: I definitely do. I definitely do. I don’t know. You know, I don’t know. I haven’t really thought about that too much, because, I don’t know, I just don’t want my mind — The way my mind works, I’m very structured and I have to like to stay in the moment. And so, if I start thinking about like setting myself up for life after football then I’m just worried that I’m not going to be like as focused as I need to be on what I’m doing. DUBNER: Let me ask you this, it’s obvious now that a lot of former athletes, even those who make quite a lot of money, when they’re done, often not done at a time of their own choosing, all of a sudden like they don’t have a career, and they often don’t have anywhere near as much money as they kind of thought they would have or they didn’t take care of it well, et cetera. But one of the conflicts I think is what you just said, which is, when you’re an athlete, you want to devote all your mental energy to being good now. Do you have any advice for athletes or for people who are trying to help athletes in the afterlife. How do you balance that? You know, do your job now, do it well, but also try to think about preparing for the future? STALEY: Yeah, I’m probably not the best person for that, because like I said, I’m not really setting myself up for life after football. DUBNER: But you’re making enough money unless you’re a total fool with it, which you seem like you’re going to be fine. STALEY: That’s the conundrum there, is where do you — Like you said, you want to set yourself up for success after football and use this avenue to kind of propel yourself into something that is beneficial for you when this is all done. Because, I mean, it’s a short part of our life right here. You know, I’ve been fortunate enough to play for going on 12 years and even then, if I retired, I mean, I’m still 33. You know, so, I have hopefully a large chunk of my life left. DUBNER: Have you ever been a player rep on your team or are you now? DUBNER: Yeah, but like if if the P.A. came to you and said, listen Joe, you’ve had this amazing long career. How would you suggest that the the median player, the guy who’s going to be in for three or four years, and who earns maybe four to eight million dollars, which sounds in the beginning like a lifetime, but it’s not. Do you have any advice? STALEY: The P.A. does a great job of setting us up with programs and stuff in the offseason of trying to take advantage. And that’s all for the players as well though, you know. And that’s sort of the thing that — What you said is, you know, for me personally like I have two young kids. The offseason is my time to really hang out and be a dad. And I love spending time with them and love being with them and all that stuff is kind of set up for, you know, week, two-week programs, and I just don’t want to sacrifice that week potentially just hang out and my kids to just go and go to broadcasting boot camp or whatever it is. And I feel like this is kind of like on the job training too for that stuff so, I mean, I try to take this stuff seriously, is what I’m doing as if this could be a potential avenue for me down the road, and something in broadcasting or something like that, but as far as taking advantage of programs I’m probably not the best person to talk about that. DUBNER: All right, so go back to last year, losing nine in a row. You’d never, had you ever been on a team in your whole athletic career where you lost nine games in a row at anything? STALEY: Well the year before that we went 2 and 14. DUBNER: Yeah, true. Yeah, all right. STALEY: So yeah, we had a rough roll there a couple of years. I think that was what it was, coupled with my body feeling bad, I was coming off a 2 and 14 year, new head coach again, kind of going the 0 and 7 route, as we were going at that point in the season last year. And was just kind of, “Oh, I just don’t want to be a part of a rebuild again.” And this is like, you know, maybe this is farther along I thought, but it’s not, you know? And I think that we have a really good thing going here. DUBNER: So, we keep hearing from players and execs that, even at 0 and 9, the locker room was good. The building was positive. STALEY: This was me personally, the locker room — And I was pretty vocal about this with the media here, was something I’d never seen before in my career. I mean in 11 years, I haven’t seen a locker room that was going through the adversity that we had gone through last season and still stayed so solid and together. There was not the — I mean, I was on teams when we were 12 and 4, 13 and 3, and we had more division in the locker room than we had last year at 0 and 9. STALEY: And we had a game when we won, against the New York Giants, and I was like celebrating like, like it was — I even had a quote in the paper here, it was like, this felt as good as when we won the N.F.C. championship game, because that was just so deserving for all the guys in the locker room to have that success to stay with it. And I think that was kind of one of the huge reasons why we finished the way we did. STALEY: It did, and it was very trying, and I think it definitely starts with leadership up front. You know, it starts with John, and starts with Kyle. The kind of culture that they set, the way they come to work after a loss, you know, and they kind of set the table for everybody else, and then, you know, some of the veteran players as well to kind of go out there on the practice field and keep working every single day. And kind of setting the example of how you work through it and, you know, not point the fingers. We had a really good room as far as that goes and then when we had a really cool rookie class last year too, that just didn’t take it the easy way out. They just kept on working really, really hard. So, it was fun to see everything come together. DUBNER: Do you think that had anything to do with the kind of people that John was looking for in his rookie draft? STALEY: Yeah, I think it definitely did. I think it was. I mean, you saw that right away, when those guys came in, they were guys that were, not so much about being an N.F.L. football player, but they enjoyed the work of being an N.F.L. football player. And football meant something to them and that’s one of the hard things to figure out about guys coming out of college now, because they’re so programmed to say what they think they’re supposed to be saying to the executives and the head coach that you really don’t know what you’re getting. And I think they did a tremendous job of figuring out who the right guy is to bring in. And we all, across the whole entire draft class last season, we had guys that really perform. STALEY: He’s a giant too. DUBNER: He is a giant. STALEY: He’s a giant man. DUBNER: We’ve been reading that you have been very helpful taking him under your slightly less giant wing. DUBNER: And this is an amazing thing to people outside of football where you’ve got guys on a team who are working with their ultimate replacements and yet trying to help them. Now, I’m guessing you, in your 12th year, it’s a little easier. If you were in your fourth year, he might be a little bit more of a threat. I’m curious if you could talk about that whole dynamic for a second. STALEY: Yeah, and it’s a little bit different too, because we have two different positions, you know, he plays right side, I’m playing left side. DUBNER: But ultimately, he’s designed to move over, right? DUBNER: When you came in as a rookie, did you have guys who theoretically could have felt threatened by you, but who helped you out a lot? STALEY: Yeah, we had a good room. We didn’t have an established guy. I came in and was competing right away. I kind of got drafted to take someone’s job. So that was a little bit different of dynamic, but it was never like, you know, there’s no other, there was no weird tension in the room about that. I just feel like, I’m trying to teach him everything I know, I feel like it’s my duty as an offensive lineman, that’s been in this league for a long time, to try to, you know, accelerate his progression as a as a football player and I’m just trying to teach him everything I can and it’s up to him if he wants to listen. If he doesn’t want to listen, he can figure out himself, and that’s kind of what I did to figure too. Figure out what works best for you. But, you know, I’m not going to, if he wants to ask me anything he can about the N.F.L., the N.F.L. life, how to take care of your body off the field, and, who to associate with, who not to associate with, all the stuff that comes with being an N.F.L. player, I’m more than welcome to, more than willing to help him out there. DUBNER: At the end of the season, winning the last five, with a Q.B. who obviously was, you know, performing really well, hopefully long term. What did that feel like for you? Like on the one hand, you were a 6 and 10 team, which isn’t very good, on the other hand, you go out with a five-game winning streak and you are feeling better. So, what was your mind like during the offseason and then now, preseason, looking toward this year? How optimistic? How realistic? Etc, etc.? DUBNER: You guys had a lot of injuries last year. STALEY: We did, last couple two years actually. We’ve had a lot of injuries, lot of guys go on I.R. I mean that’s just the thing, is taking it one day at a time and I think we’ve done a good job of that this offseason so far. DUBNER: Were you a big fan of Richard Sherman in previous years? STALEY: No, because he was on the other team and he was so good, but I think that was part of the reason why I wasn’t, because he was so good at what he did. It’s so frustrating to go against, because you kind of knew that side of the field is always going to be taken care of. STALEY: Whenever we play the Seahawks. So, I’m super excited to have him on our team, obviously. I think he’s a great person, great player. He brings a ton of veteran leadership to the locker room and especially in that D.B. room that we have right now. It’s a young room. To add him as a veteran voice in there is going to be nothing but positive. DUBNER: How many games would you need to win this year to considered it a successful season? DUBNER: You’re probably the only guy here, maybe a couple, who lost the Super Bowl, right? STALEY: Me and Garret Celek, I believe are the only two left, right? I think Celek, wow. DUBNER: What’s that feel like? STALEY: Losing the Super Bowl or being one of the last two? DUBNER: No, losing the Super Bowl. STALEY: Oh man, it sucked. Oh, that’s like the worst day of my life. Thanks for bringing that up. STALEY: I mean, we were so — The way we did it too. It’s still very fresh in my mind. You know, we are down big early, then had that big comeback in the second half, and then had that drive in the fourth-quarter, time was running out. We had a first and goal from the 7-yard line. Thinking that we’re going to go in, we had the best rushing attack in the N.F.L. and, you know, we pass it four times or three times. We ran it the first time. STALEY: Yeah and then lost, I mean it just sucked, because you were so close. You could just taste it, you know, that victory is so close. But it wasn’t meant to be. So, here I am, and I play ‘till I’m 20 you know. STALEY: 21 years and I’ll win a Super Bowl. STALEY: Oh gosh here we go. DUBNER: I think Hakuna Matata is the finest I’ve ever heard. DUBNER: It’s absolutely extraordinary. So, I would be so honored. STALEY: You want some Hakuna? STALEY: Do you like Moana? DUBNER: I don’t know Moana. STALEY: All right well, I know Moana. DUBNER: What’s your repertoire? What do you got? STALEY: I got four-year-old daughter who’s obsessed with Disney songs. So that’s my repertoire right now. STALEY: And Moana’s her go-to. DUBNER: I’m sure I’ll love Moana. It’s really up to you. STALEY: Okay, okay, okay. [singing] I see what’s happening. Yeah. You’re face to face with greatness and it’s strange. You don’t even know how you feel. It’s adorable. It’s nice to see that humans never change. Open your eyes let’s begin. Yes, it’s really me, it’s Maui, breathe it in. I know it’s a lot. The hair, the bod, when you’re staring at a demigod. What can I say except you’re welcome. All right I’m gonna do Hakuna Matata. PRODUCER: By the way, you know who sings that, Stephen, in the movie? STALEY: [singing] Hakuna Matata, what a wonderful phrase. Hakuna matata, it means no worries for the rest of days. It’s our problem free philosophy, hakuna matata. There you go. DUBNER: Extraordinary. Ladies and gentlemen, Joe Staley, left tackle for the 49ers and future musical theater. STALEY: [singing] I’ve got gadgets and gizmos aplenty. I’ve got who’s it’s and what it’s galore. You want thingamabobs, I got. Is it 20 or plenty? PRODUCER: Hey wait, you don’t have kids. What are you doing? STALEY: [singing] But who cares. No big deal. I want more. DUBNER: I can’t believe there’s a question about what you’re doing after football. It seems obvious, children’s theater. Pleasure, and I thank you very much for that. I wish you a very successful season. DUBNER: Okay. Thanks so much for coming in. STALEY: I listen to you guys all the time, too. And here now is our conversation with the brand-new 49er and giant of a man that Staley was talking about: offensive tackle Mike McGlinchey. DUBNER: You are going to be starting here, playing right tackle, I understand, yes? Migrating eventually to left tackle probably. MCGLINCHEY: If that’s their plan. I’ll do whatever they say they need me to do. DUBNER: So here’s the thing. We always hear like — Obviously you’re a first round draft pick, so nobody’s trying to bury you. But we do hear the stories about how veterans who are trying to, you know, theoretically make welcome young guys at their positions sometimes aren’t as welcoming as they might be. I know that you’ve been getting good advice and welcome from Joe Staley. I’m just curious like, what your expectations were and so on, on that front. MCGLINCHEY: Yeah, I really didn’t know what to expect, because I’ve heard a lot of different things. I came from an O-line room that was completely the opposite of that. At Notre Dame, we always helped out everyone that came into the room, no matter what age you were, you were always welcome to — part of the family. And fortunately here in San Francisco, I’ve had the same experience thus far. It’s an awesome group that we have. And there hasn’t been anybody that’s making you feel like crap or anybody that’s making you pay your dues too hard, other than you know, a couple jokes here and there. But you know, it’s been an awesome experience with all the vets. All the guys that we have in our room. And everybody is just trying to do the same job and that’s the —. DUBNER: Is there any rookie hazing anymore? MCGLINCHEY: Nothing that I’ve experienced. I mean, we’re only in day two of practice, so I’m assuming I’m waiting until training camp. I still have my guard up a little bit. So even in two weeks, I still have a little bit of a guard up to see what’s coming. DUBNER: And you’re weighing what? MCGLINCHEY: Like 310, something like that. DUBNER: And what’s your optimal weight? Is that it? MCGLINCHEY: Yeah, it’s a West Point. A family friend of ours plays basketball there. I think they mis-bought a 2XL. I was one guy that I knew for it. DUBNER: You come from a big family, four brothers, one sister, something like that? MCGLINCHEY: Four brothers, one sister. I’m the oldest of six. DUBNER: Okay. Are they athletic? MCGLINCHEY: Yeah, yeah. Nothing — I don’t know. We’ll see. They’re all younger than me, so I don’t know if anybody’s gonna make it to the N.F.L.. But yeah, they definitely play their sports. DUBNER: Yeah. So how many games have you missed due to injury in the last ever years? MCGLINCHEY: Never. I’ve never missed a game. Unless there was like a family obligation when I was in first or second grade, but I can’t remember that. DUBNER: But since you play football, presumably you’ve been a little bit injured. What are some of the things you’ve played through? MCGLINCHEY: A sprained left ankle. Stomach flu. Broken hand. You know, a couple nicks every other where. So nothing major. MCGLINCHEY: It depends on how much you love football, I guess. Yeah. DUBNER: Can you explain, especially for people who don’t care or know anything about football at all, like, what’s your job. MCGLINCHEY: My job is to open up running lanes and keep people off of Jimmy Garoppolo. I just kind of get in the way, is really what my job is. DUBNER: So the paradox or I guess — maybe it’s not a paradox — The hard thing to come across is someone with your size who is also fast and coordinated and a good athlete. So there aren’t that many of you to start with. But then there are a lot of people your size and speed who don’t make it. So what is it you think that is the difference between people who are physically capable and who are gifted with the size, but who don’t have the capability to play at your level in college? And now in the N.F.L..
MCGLINCHEY: Oh, I think it’s all mental. I think it’s about how much you want it, how much you love it, and how much you’re willing to sacrifice for it. I was never the best athlete on my team. I’m still not the best athlete on my team here. But I’ve always wanted it more, I’ve always worked harder than everybody else. And just attention to detail and the things that — You need to know how to self-correct, you need to know how to learn. And I was always pretty good at learning. So the faster you can do that, and combined with, you know, really truly wanting something that bad, that’s what separates everybody out. DUBNER: Give me an example that like — I like football. I’ve liked football my whole life. But, I really don’t know — When you talk about learning how to learn, in your position, give me an example of a particular thing that you’ve gotten better at maybe over the years, and how you figured out how to get better. MCGLINCHEY: I think it’s just fundamentally how to move. Playing offensive line is one of the more unnatural human movements on earth. In sport, I think. You’re required to move other large men out of the way and when you’re trying to stop them in pass protection, you’re completely moving backwards. So it’s a different thing to have to learn how to do, and until your body can feel it, until you can watch it on film and self-diagnose when things happen, that’s where the separation comes in. DUBNER: So when you watch yourself on film, what do you look for, what do you learn from? Do you look at a case where if you’ve been beat, what you were doing, were you bent all wrong? MCGLINCHEY: Well you know, when you get beat and you’re at this level, you know why, pretty much immediately. You’re just looking at it to look at it and visualize it, how not to do it again. DUBNER: When you say why, does that mean because it’s you, or because it’s the other guy? MCGLINCHEY: I’m pretty convinced that offensive — unless you’re getting an absolute freakozoid — all defensive players are playing off of what you do. So if I can control what I can do better than the other guy, then I’m going to be in a better position. DUBNER: Right. What about just confidence? Does it ebb and flow for you? MCGLINCHEY: I think it is when you’re young, when you’re first starting out at a major level football, like it did at Notre Dame for me. My first couple of years, I certainly didn’t believe that I was going to be what I became to be. And I’m still not, I don’t think, what I want to be. So it’s always a learning process of continuing to move on and continue to get better, and you know, definitely confidence waives a little bit when you’re young and mistakes constantly are happening. But when you get to this level, if you’re not confident, you’re probably not going to be able to, you know, do your job. DUBNER: But that said, I mean, there are a lot of guys who get drafted first round, who don’t work out. There are a lot of guys who were undrafted, well maybe not a lot of guys who were undrafted, but they’re undrafted guys who do become great players, become Hall of Fame players. How do you account for that? MCGLINCHEY: I think that a lot of guys come from smaller situations or different situations in college that they know that some of the undrafted guys that had a tough situation in college, came from a smaller school, had other people producing ahead of them at their school, and they’re late bloomers. And then once they get their shot, and eventually some — if you really, truly want it, a flip will switch inside you to make — make sure it happens. And I think sometimes first round things, there’s a lot of — especially in today’s day and age — there’s a lot of media attention, and if you play at a big time program or if you have a lot of media attention behind you, you’re kind of pressured in making picks that necessarily aren’t the best ones, and it’s a mixture of misinformation of first round guys, of who they are as a person and what they can do as a player. And I think some of it’s probably a little bit of complacency as well. DUBNER: Being a first draft pick, there’s obviously a huge pride or badge of honor associated with that. But on the other hand, especially when you come into your team now, and you were your team’s first pick this year, what kind of pressure does that put on you? MCGLINCHEY: I’m not really worried about the pressure. And I think that’s one thing that I learned greater as college went on and you know, once attention starts getting toward your way, then expectations just continue to grow and you should look at expectation as something that you’ve earned. And I think that’s something that I’ve always tried to do is, if people are expecting the highest and most production out of me, then I’ve done something right along the way to get there. So I just have to stay true to what I’m doing and stay true to who I am and good things will happen. DUBNER: If I recall — and I may be wrong. So pardon me if I am. You were not contacted by the Niners during the run up to the draft, is that right? MCGLINCHEY: I had one formal interview with them at the combine for 15 minutes long, and that was the only contact that I had. DUBNER: You probably had contact with a lot of other teams as well? MCGLINCHEY: A lot of other teams. I had individual workouts where coaches came to my school. I was flown to — some of these teams were three or four different visits with them. And you know, sometimes it’s just all facade and they’re trying to play a hand with other teams, or sometimes it’s really truly invested interest in you. But yeah, I think that I’m lucky because I love the situation here. I love where this organization is at. And you know, the area that I get to live in now is pretty sweet, too. DUBNER: I mean, you always hear these cat and mouse games that a team won’t contact a guy like you because they don’t want to tip to other teams that they’re interested in you. Did you talk about that after the fact with John or Kyle? MCGLINCHEY: I didn’t talk about it necessarily. I did a little bit with Kyle, because he he was joking around with me because he was so close with my cousin Matt, who was his quarterback for two years in Atlanta. MCGLINCHEY: Yeah, he’s done a pretty good job. But Kyle and him were pretty close and he didn’t even tell Kyle that they were interested, just because he didn’t want it to get back to either me or somebody else. MCGLINCHEY: Well, just so that things didn’t happen unpredictably during the draft. DUBNER: So they don’t lose you to someone else. So how surprised were you? Who did you get the call from, John or Kyle? MCGLINCHEY: John was first and then Kyle was right after him. Yeah. So as soon as Roquan Smith was announced for the Bears, my phone rang and it was John Lynch on the other line. And pretty excited. I didn’t expect it to happen. But it was pretty awesome. DUBNER: Yeah. This team has obviously had a pretty eventful last 50 years, but the last you know, 5, 8, 10 years particularly, some good and a lot not so good. What’s it feel like to be coming on to a team — obviously you’ve got your stuff to take care of — but this team is in turnaround. It started out really bad last year, then ended up really, really good. I’m just curious what you think of is like, what are you going to contribute to that turnaround? MCGLINCHEY: Well, I hope to continue to do my job and to the best of my ability, and at the best ability in this league, to help the 49ers win games. The only three goals that I’ve ever had in my career of playing high level football is to help my team win, be the best at what I do, and then you know, the third one is be the best offensive line unit, I guess now, in the N.F.L.. It was in the nation in college, but now it’s in the N.F.L..
DUBNER: Yeah. You were captain at Notre Dame twice, right? What are some duties associated with that that the public might not know about? MCGLINCHEY: I don’t know if there’s anything, you know, everybody knows what a captain does. DUBNER: You’re not doing bed checks. MCGLINCHEY: No. I mean if it’s needed, I would have. But we had a pretty good group of guys at Notre Dame that it wasn’t — we had some hard times there. In my true senior season, we were four and eight. It was a hard season. But you know, it’s just the normal being-a-good-teammate, set the example, and if anything that needs to be said, that needs to be said, you say it. DUBNER: How many calories do you eat in a day? You know? MCGLINCHEY: I don’t count. I just try to eat what’s right for me. And I know my body at this point, of what I need to eat to keep weight on or if I need — I haven’t really ever had the feeling of needing to lose weight. So to get my body to feel and look the best that it can — I know what I need to do. DUBNER: So I weigh like 172. Do you think you could like, break me? DUBNER: Like what if — just throw me up against the wall here. MCGLINCHEY: I don’t know if I have that — I don’t know if I have that killer instinct in me to just do that. DUBNER: You mean right now? MCGLINCHEY: Well, if I step between white lines it’s a little different. DUBNER: I know that. You’re also the smartest. MCGLINCHEY: That’s the thing with football. It’s a dangerous game — it’s hard. It’s hard to live through, and it’s hard to be able to flip that switch, and some guys, unfortunately, aren’t able to have as distinct lines with that. But the good ones do — and the best guys do. And it’s a matter of you know, when it’s time to work, it’s time to work, and you have to have that edge to you. But you know, when you’re in everyday life, you’re no better than anybody else. DUBNER: It’s really interesting you say that. A sports journalist, really good sports writer, once wrote this thing that captivated me about sports, because I’ve been a sports fan for a long time. He said, when athletes get in trouble everybody says oh you know, they kind of make more of it than is normal. And he said that if you think about it, sports, you’re encouraged to do all these things that you’re not allowed to do. MCGLINCHEY: Yeah, you’re supposed to be big and mighty. You’re supposed to be that as — There’s supposed to be a different aura about you when you when you get onto a field that it’s not normal for society. It’s a hazy world if you can’t manage yourself. But I’ve never had that issue. DUBNER: Well we know that you can manage yourself. Have you had guys on your team, Notre Dame let’s say, who you saw were having a hard time drawing that line and tried to help them? MCGLINCHEY: Yeah, I think it’s not as much of a physical thing as it is mental. You know, when guys get a little too big for their britches, you’ve got to bring back a little bit, or they’re just nonresponsive, and you got to figure out a way to you know, probably get them off your team. So like I said, you know, you’re a great football player, we can we can all be great football players, but in the end of the day, we’re no better than anybody else. We have a job. Other people have jobs that they do. So it’s just our line of work. You know, it’s different — just a different field of work. DUBNER: Yeah. I thank you very much and I hope you have a great first year. And I wish you all success. Next up: Kyle Juszczyk, a fullback about to start his second season with the 49ers. Kyle JUSZCZYK: Just got done doing some brain training. DUBNER: What is brain training? JUSZCZYK: So, basically like gets you out of that fight or flight sense where a lot of us, we could just sitting in a room like this and, for whatever reason, your brain is in that fight or flight state and it can’t calm down and can’t get into this recovery mode. So, we do this thing where like we watch, basically you’re hooked up, these sensors are reading your brainwaves and depending on how they’re reacting while you’re watching a movie, that movie will either shrink or pause or brighten and it’s kind of like giving your brain feedback on how it’s supposed to act. DUBNER: This is over multiple sessions, over multiple days or something? JUSZCZYK: Yeah so, I’m trying to log I think it’s 15 hours’ worth of training and I’m about 12 hours in. DUBNER: How many other guys on the team are doing this? JUSZCZYK: I don’t know how many players, do you know? Probably like six? DUBNER: And why did you volunteer? JUSZCZYK: Well, I had a concussion last year and so this offseason I decided that I wanted to put a lot of energy towards my brain this offseason. So, this was something that I came across and jumped on. DUBNER: And what happens when you become proficient at 15 hours? Can you like hypnotize me? JUSZCZYK: Well, I’ll get a reassessment at 15 hours. JUSZCZYK: And we’ll kind of see, you know, where my brain is at, but I’ve already seen the benefits of it where anxiety levels have gone down, big time. Sleeping well and I already feel like I’m processing information faster. So, it’s pretty cool. DUBNER: Wow. Now, how do you persuade yourself that that’s not a placebo? JUSZCZYK: Even if it is that’s what I always say about the placebo effect. DUBNER: Yeah. Right, right. Of course. JUSZCZYK: Even if none of those supplements in my locker work or technically work, if in my head they are then they are. DUBNER: Has it translated at all into playing football? JUSZCZYK: Well, I mean today was only our second day of practice. I want to think that I was processing things visually quicker today. So, hopefully. DUBNER: Interesting, yeah. Let’s back up just, since we didn’t get it, would you just say your name and what you do. JUSZCZYK: Yeah. Kyle Juszczyk, fullback for the San Francisco 49ers. DUBNER: Okay, you happened to go to Harvard. JUSZCZYK: Yeah, don’t use that against me. DUBNER: I won’t use it against you. How many Harvard alumni are in the NFL these days? Do you know? DUBNER: There’s quite a few. JUSZCZYK: I think we have somewhere around like 12 maybe? JUSZCZYK: There’s a good amount. DUBNER: Yeah, yeah. So, your career, you started Baltimore correct? First four years, Baltimore? JUSZCZYK: Four years Baltimore, this is my second year with San Francisco. DUBNER: Then you came here, okay. All right, so you came in just in time for all the fun here. Right? So, you were coming on to a team that had gone 2 and 14 the year before. DUBNER: And then last year was the dawn of a new era. DUBNER: Just walk me through your process last year with 0 and 9 and so on. DUBNER: You’re married by now I assume? JUSZCZYK: Not yet, actually, long engagement. DUBNER: Wow, that’s a long engagement. DUBNER: How’s she taking that? JUSZCZYK: Yeah. We’ve got a date set for this next summer. JUSZCZYK: But, just working with that, having to figure out where she’s going to be coming with me, but everything worked out great. When my agent went to the combine, he’s talking with a lot of different teams, and got a sense that San Francisco was really interested. And the idea of coming out to California, the idea of playing for Kyle Shanahan, were two really great ideas to me. Playing for John Lynch, a former player. DUBNER: Did you know much about them other than what, you know —? JUSZCZYK: I knew a lot about Kyle, because when I was in Baltimore, there was rumors that we were going to hire him as an offensive coordinator. JUSZCZYK: And he’s kind of from that Gary Kubiak tree and that offense fits me very well, and I had a great year when Kubiak was my offensive coordinator. So, I was excited about that. Definitely knew who John Lynch was, remembered him as a player, and just like the idea of a former player running the organization. I thought that was really cool. DUBNER: So then when you first heard that they were interested in you, did you have pause about the Niners considering that they had some rough years? JUSZCZYK: Yeah, I mean that was something I definitely had to consider, was coming to a team that didn’t really have a ton of success, but I tried to kind of spin it in my head to think about it as, like how cool would it be to be part of that first class almost that turns it around. You know, it’s almost like going to that college and being part of the first recruiting class for that head coach that turns the whole thing around. And that’s how I kind of looked at it here. We were kind of Kyle’s first free agent class that, you know, hopefully can get this thing turned around. DUBNER: And then, obviously, it didn’t turn around, at least in the beginning. So, what, I mean, I look at it now collectively as 0 and 9, but obviously it’s one week at a time and I’m guessing it gets a little bit more frustrating every week. DUBNER: What was going on for you then? JUSZCZYK: Definitely super frustrating, not how we expected things to start, but you’d be surprised just how positive things stayed around here. It was pretty incredible. Not something that I was used to experiencing. In Baltimore, if, you know, we lost a couple games in a row, I mean, things were getting crazy in the facility and people are walking on eggshells. DUBNER: Well, you’ve got a Harbaugh in charge, what do you expect? JUSZCZYK: Exactly. But nobody was walking on eggshells here, we were still very confident that we were moving in the right direction. And every week Kyle would pull up some clips to show like, we’re making progress, I swear guys. Hey, just stick to it and it’s going to turn around. And once it, man it made it super rewarding. DUBNER: You know, we’ve heard exactly the same thing from everyone from Jed, to players, etc. Which is that, you’d never know from the locker room that it was an 0 and 9 team. And, I’m just curious, I guess kind of hooking up the two things you said about your brain training and Kyle showing you clips of things that are going well. Do you think he was practicing some kind of positive psychology that worked? DUBNER: Because, I mean the reality was you were 0 and 9 and yet people seemed to think that success was coming still. JUSZCZYK: Yeah, definitely. I think you don’t see the positivity in like our record. We’ve got to find it somewhere else. So, he did a great job of showing us those clips and showing us, you know, just exactly what you’re doing well and, you know, as a football player if you’re never getting, or at least the way I work, if I’m never getting any positive feedback, I mean, that makes things really tough. So, for him to do that, I know that really struck home with me to, you know, he shows me a clip from the game, a clip from practice that week where I did something really well and he points it out. I’m like, okay, you know, I’m doing something right and it motivates you. DUBNER: We think like you could have a pretty good game then they call you in and show you, this is the block you missed and so on. JUSZCZYK: Oh, that definitely exists. And I’ve definitely been a part of that too. But, I almost feel like it’s more of a kind of a new age thinking of this more positive feedback and I know it definitely resonates with me. You know, I’ve never gotten much from a coach that’s just screaming at me and telling me how terrible I am. I don’t know. That just doesn’t work for me. I like a guy that points out when I do something incorrectly, but he also rewards me when I’m doing something the right way. DUBNER: Yeah, that’s interesting. So, are there any other examples you can — Because that’s the best example we’ve heard of how the positivity kind of happened, which him showing you the cuts of you doing good stuff. Can you give any other examples? JUSZCZYK: I mean, I just think about my times with the Ravens, when things weren’t going well, there was just a mood in the building. When you’re passing coaches in the hallway, like you’re trying to keep it short, you’re not trying to make a ton of eye contact, you just want to get moving and get through your day. Where here it just, it really wasn’t like that. You saw your position coach and it was easy to still go talk to him, you didn’t feel awkward, I didn’t get any sense of that. DUBNER: What are your expectations for this year? JUSZCZYK: I’ve got high expectations. I expect to win. I think you can already feel it just from two practices that we’ve had so far that things feel a lot different than they did last year. There’s a lot more confidence. There’s, on the offensive side, there’s definitely a better understanding of the offense as a whole, you know, because we’ve been in it for a year. DUBNER: Was it a lot of relearning for you? Was it a system that took a lot of work? JUSZCZYK: Well, I’d played in a system that was similar. But, I mean, Kyle takes everything to a whole other level. So, there was a lot of learning new stuff. And, I mean, for anybody, when you’re learning something new, you don’t react quite as fast. You know, there’s just that millisecond of hesitation and you’d be surprised what a huge difference that can make. DUBNER: So, can you help me reconcile this? Here’s what I don’t understand, I know that N.F.L. offenses are super complex, right? DUBNER: Laypeople, we literally wouldn’t even understand the terminology in the play call, right? At all. And you’ve got 11 guys who all A., understand it, B., then execute it, at the same time, at lightning speed. Okay. So, we know how hard that is, but then we also see that Jimmy Garoppolo comes in, and after like ten days, is basically running that offense and winning five games in a row. How do you explain that? JUSZCZYK: That’s a great question. I think you’ve really got to give Jimmy a lot of credit. I think he did such a good job of — I mean, he put in serious time, after practice, with the coaches, by himself. I mean, he was here all night just trying to learn this playbook. And I think he also got to attribute the fact that he was able to extend plays. He’s able to get the ball out quickly, and people always ask, what was the difference in our offense before Jimmy and once Jimmy came along. And I think the difference was we were converting on third down. And when you convert on third down, you get to run more plays. When you run more plays, you get to dive deeper into your playbook, and into your game plan of that week. And that’s when you get to really start to exploit the defense and all that work you put in this week where, okay, we saw they were doing this like and we’re going to take advantage of that. Well, when you’re three and out, you can’t really set things up, you know, but when you’re actually moving the ball and getting first downs, you start to set things up and things really start to come together. DUBNER: You had a concussion last year you said. Was it during a game or practice? JUSZCZYK: So, we were playing the L.A. Rams, it was a Thursday night game and it was week three and we are on the goal line and just running a lead play and smacked my head with their linebacker and just had a really, it was really weird. I remember it like sounded like, like I remember hearing a noise in my head. It was almost like a bell like just ringing. I remember feeling like a tuning fork. Like for a guitar or something. It weird the weirdest feeling. Right after that play, you know, I’m pretty shook up, but we got back out to the line very quickly, we’re trying to get another play in. And I remember, I’m sitting in the huddle and I’m definitely messed up. But like do I sit down and wait for the trainer or do just run this next play and then figure it out after that? Well, it all happened so quickly I stayed in and I ran the next play and it was the worst decision. Same thing, ran into linebacker and that one finally put me out, where I was, you know, unconscious for a second and then had to get taken in by the trainers and all that kind of stuff. DUBNER: How much of it is also just, you know, macho? JUSZCZYK: It definitely is changing. Like there’s no shame in like taking yourself out in that situation, like your brain is way too important for this kind of stuff. And I think guys are starting to understand that a lot more, but it’s still I think so ingrained in all of us that there’s a little bit of that pride that still, you know, keeps guys in there maybe a play or two longer. DUBNER: Had you had concussions previously? JUSZCZYK: Nothing officially registered. Definitely, I’m sure I had. DUBNER: John Urschel, who we’ve had on the show actually a couple times. DUBNER: He’s really — I love him. DUBNER: I mean, he’s just such a nice guy, interesting guy. So his decision to retire I think was misunderstood, it was more complicated than just, you know, I saw the report. DUBNER: He’d had a concussion, I think he got in practice when he was with the Ravens. DUBNER: I’m just curious, you know, whether his decision, whether that made you think about anything differently yourself? JUSZCZYK: Yeah. You know, I would never take it to the point, or at least I don’t think I would retire unless, you know, I’d started to rack up a lot of concussions that became a problem. But it’s just I love the game too much that I don’t think I can step away from it early. And, you know, so that I don’t run into that situation, that’s why I’m trying to do some of these different things to really strengthen the brain and just get a better understanding of it. And all of those sort of things. DUBNER: Do you meditate or have you ever —? DUBNER: Yeah. Does it, have you noticed any effect from that as well? DUBNER: Twice, you try twice a day or —? JUSZCZYK: It’s usually just once before, I usually do it before I go to bed. At the very least, I try to do it the night before games. But I do a pretty good job of it. DUBNER: Tell us something about being a professional athlete or more specifically, you know, an N.F.L. fullback that you think most people just have no concept of or wouldn’t understand or maybe appreciate maybe. JUSZCZYK: I think a lot of people, I don’t think they understand the amount of time that’s put in outside of Sunday. You know, I think a lot of people they know we practice, they know we work out, but I don’t think they realize that like during our phase two of our offseason program, we’re only blocked for four hours. I’m here for eight, nine hours. You know, like we are only required to be here for that four, but I don’t think people realize just how much time is really spent in this facility. DUBNER: Have you been on teams where most guys would only be there for the minimum? JUSZCZYK: Baltimore is pretty good. Like most of the guys were putting in that extra time. But, I would still say like it doesn’t really compare to here. I think they do such a good job of — there’s so much available for us here. JUSZCZYK: I mean as far as our nutrition is like off the chain, it’s incredible. There’s so much information available there. I mean the food is great. I do a lot with our dietitian where — I mean, right now we’re doing another kind of a brain study. We’re doing D.H.A. supplement tests. But, you know, like I have that available, I have the brain test available. Our training room, our medical staff, is so great about — I can go in there and ask for anything. I can get cupping, and get Graston, I can get acupuncture. I can just get a massage flush if I need it, you know. Hot tub, cold tub, sauna, steam room. We’ve got the weight room always available, we got cryotherapy there. JUSZCZYK: It’s a chamber that they pump nitrogen gas and they’re super cold. And you’re in there for like three minutes and it drops your body temperature super low. DUBNER: So, tell us, let me just ask you about a series of — Give me like what you’re doing Monday at 10:00 a.m. typically, during game, during the season. JUSZCZYK: During the season? So that’s Mondays are like body maintenance. Right? Tuesdays you’re off day here then? JUSZCZYK: Okay. So, Monday at 10:00 a.m. probably getting a massage. JUSZCZYK: Friday at noon we’re on the field. DUBNER: Okay. Sunday, let’s say 8:00 a.m. with a 1:00 p.m. game? JUSZCZYK: Probably starting to get up and get ready for breakfast. DUBNER: At the team hotel? DUBNER: Then what about Sunday night, let’s say? JUSZCZYK: Sunday night after the game? DUBNER: Yeah, after the game. JUSZCZYK: You know, it depends if somebody is in town for the game. Usually there is somebody, so we’re probably grabbing dinner somewhere with a friend or family that’s visiting. DUBNER: Yeah. Thanks, it’s great to talk to you. Really great talking to you. JUSZCZYK: Great meeting you guys, too. Thanks to Kyle Juszczyk, Mike McGlinchey, Joe Staley, and Jimmy Garoppolo for taking the time to sit down with us. And special thanks to Bob Lange, vice-president of communications for the 49ers, who made all these interviews happen. If you want to hear more of our interviews with 49ers players and management, sign up for Stitcher Premium. You’ll hear Jed York, the team’s owner, and other front-office executives; head coach Kyle Shanahan and general manager John Lynch; and several other players. Just go to StitcherPremium.com/freakonomics and use promo code FREAKONOMICS for one month free. Freakonomics Radio is produced by Stitcher and Dubner Productions. Our staff includes Alison Craiglow, Greg Rosalsky, Greg Rippin, Alvin Melathe, Harry Huggins, Zack Lapinski, and Andy Meisenheimer. The music you hear throughout the episode was composed by Luis Guerra. You can subscribe to Freakonomics Radio on Apple Podcasts, Stitcher, or wherever you get your podcasts.